In this piece from Mountaineer magazine, Craig Romano reflects on a life of adventure, and what Walden Pond meant to him. I grew up in a small town in New Hampshire, about 30 miles north of Walden Pond, where Henry David Thoreau took refuge from an increasingly urbanized society. He spent two years, two months, and two days living in a small cabin there. I was first introduced to the works of this great naturalist, philosopher, and writer while attending high school in the Merrimack Valley. As a teenager and throughout my adult life, Thoreau's essays have had a profound effect on me. They’ve helped me find peace and beauty in the world, and they’ve validated my lament that we as a society continue to worship materialism, growing ever more separate from nature and its redeeming qualities. My love for the natural world and for endlessly walking through forests, over hills, and up mountaintops, and paddling down rivers, across lakes, and through bays and estuaries, is a result of growing up in rural New England. The places that inspired Thoreau – Mount Monadnock, the Merrimack River, the White Mountains, and the Maine woods – inspired me too. Through the simple but fulfilling acts of hiking, walking, and paddling in these places, my love for the natural world and my desire to protect it was shaped. In my late teens I began to travel extensively beyond the region, always searching for wild places. My travels took me from Alaska to Patagonia, but my heart always remained in those New England woods and hills that had transformed me into an observer and admirer of the natural world. In 1989 I ended up in the Pacific Northwest. I had traveled here three times prior, but this time I didn’t return to my beloved New England. The allure of the Cascades, Olympics, and the ancient forests of the region now held me captive. Thoreau's philosophy of living a simple life and seeking spiritual discovery through the natural world continued to guide me as I pursued new haunts in my new home. A dog-eared copy of Walden Pond became a component of my backpack. On many a Cascades peak and by many an alpine lake, I continued to look to Walden for inspiration. Walden Pond had become more than a place to me; it had become a frame of mind. When I return to my native New England, I often tramp forests, peaks, and preserves both familiar and new to me. Occasionally I make the pilgrimage to Thoreau's (and my) Walden Pond. The pond and surrounding forest is now part of a state reservation. In summer the pond bustles with visitors – many oblivious to this body of water’s literary fame and its sacredness to acolytes of Thoreau and lovers of the natural world. 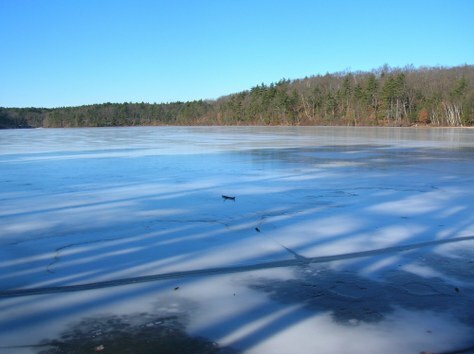 I prefer to visit Walden in the winter when the lake is frozen and ringed by snow. During this time the lake is often quiet, but never silent. Deep in thought, I can walk the trail around and to the site of Thoreau’s cabin, interrupted by no one except perhaps a raucous blue jay or a showy cardinal. By now most of Walden’s avian residents have taken refuge in Florida and South America, and the pond’s small mammals and copious amphibians have burrowed into dens and or deep down in mud waiting for spring’s warming sun and new bounties. Sentinel white pines and red oaks flank the small pond. Leaves rustling in the wind call your attention to the voices of the forest. While it’s been nearly 170 years since Henry David sat, reflected, and scribed along these shores, his spirit is still very much alive here. I reflect upon the forest surrounding the cabin site. The original canopy was cut down long ago to fuel the railroads. The tracks still run behind the site. Man's progress is inescapable and often detrimental to the natural world. The forest, however, has returned here. When given the chance or left alone, Nature is resilient. And Nature's power when unleashed on a wary or tormented soul is healing and renewing. "I went to the woods because I wished to live deliberately, to front only the essential facts of life. And see if I could not learn what it had to teach and not, when I came to die, discover that I had not lived." These words that have been guiding my life for decades; and to parapharse another of my favorite New England writers, that has made all the difference. 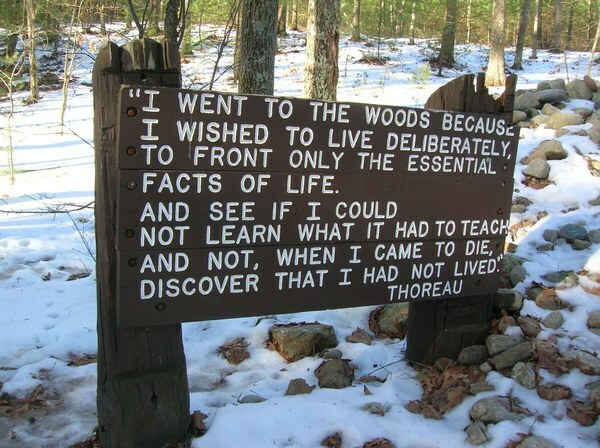 One of Thoreau’s famous quotes stands beside his cabin site at Walden Pond. Photo by Craig Romano. Craig Romano is an award winning author of more than 20 guidebooks, including the newly released, Urban Trails Seattle and Urban Trails Everett (Mountaineers Books). These guides are filled with great places to connect with nature on your next hike, walk, or run. This article originally appeared in our Winter 2019 issue of Mountaineer Magazine. To view the original article in magazine form and read more stories from our publication, click here.